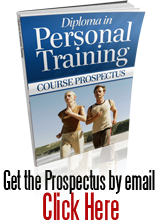 Are the tutors professional personal trainers? Yes, all tutors are working as professional personal trainers. Does the cost for the course include everything I need? Or are there any extra fees? There are no other costs or fees. Can I spread the cost of the courses over a period of time? Yes. You can make five monthly payments. It costs 20% more. You can find the cost of paying by installments by clicking here. You can also get an online-only edition of the course, which is £100 cheaper. With this, too you can pay by instalments. How could I get my money back if I don't like the course? Just return the course in good condition within 60 days of receiving it, and we'll send you a full refund. How long does it usually take to complete the course? Many students complete the course in five months. But you can do it as quickly or slowly as you want. That's one advantage of distance learning. Do I need to finish the course within a certain time? You can take as long as you want. Unlike other organisations, we don't set any time limits. You can find the cost of the course by clicking here. I live in the USA, UK, Ireland, Australia, Canada, Borneo etc. Is the course suitable for me? Yes. We have students in 28 countries. How can I contact my tutor or the Blackford Centre? There have two types of people you can contact - your tutor and a course advisor. The tutor marks your work, and helps you with any problems. You can fax, e-mail or post assignments to your tutor, whenever you want. We don't give out the tutor's phone number, because a few people would spend all day talking to their tutors, who would never get any work done. But sometimes students get stuck, or have an urgent query. If so, you can phone a course advisor at the Blackford Centre at any time during work hours. If you leave a message out of work hours we'll ring you back the next day. You can contact course advisors as often as you want, and about anything to do with being a personal trainer. Can I contact other students? touch with other students. You can swap ideas, or solve problems together. Is the course accredited or endorsed? Yes. Our course has been endorsed under the ABD Awards and Certa Awards Quality License Scheme. This means we have undergone an external quality check to ensure that our organisation and the courses we offer meet certain quality criteria. ABC Awards’ And Certa Awards’ endorsement involves a robust and rigorous quality audit by external inspectors to ensure quality is consistently met. A regular review of courses is carried out as part of the endorsement process. To this end, the learning outcomes of the course have been benchmarked at Level 4 Award against level descriptors published by Ofqual, to indicate the depth of study and level of difficulty involved in successful completion by the learner. ABC Awards and Certa Awards is a leading national Awarding Organisation, regulated by Ofqual and the Welsh Government. It has a portfolio of over 650 Ofqual regulated qualifications on the National Qualifications and Credit Framework (QCF). It has a long-established reputation for developing and awarding high quality vocational qualifications across a range of professions. When you successfully complete this course you will receive a Certificate of Achievement by ABC Awards and Certa Awards and a Learner Unit Summary (which lists the details of all the units you have completed as part of your course). Will the course give me credits towards a degree or some other study? No. But it will help you set up and run your own business. And we encourage all students to continue their studies after completing the course. Do you have REPS accreditation? We haven't sought accreditation from REPS because their training requirements are based on a classroom model with supervision, and has pre-entry requirements. Our training is through distance learning, with no pre-entry requirements; and is accredited by ABC as equivalent to Level 4 on the National Qualifications Framework. Will your course let me work in a gym? Some gyms ask for REPS qualification, which we don't offer, and some don't. A more interesting and lucrative career is as a private trainer, working with your own private clients. You may then get extra work in a gym at a later stage as people learn about you. Some of our enquirers hope to get private clients by working in a gym. However many gyms ban you from using their members as your private clients. There is a clear conflict of interest, and it may lead to problems if you are seen to be 'stealing' clients. Once you've completed our course, you can start your own business as a Personal Trainer and begin to earn immediately. When can I do the course? Can I start the course at any time? Where can I study the course? Is the course all from home, or do I have to go to a test centre? How can I be sure that you're legitimate, and that you won't disappear with my money? Here are some answers we hope will reassure you. We've been in operation since 1995; so we're very established. We publish our physical address at the bottom of each page - and you are welcome to visit us. We're audited by ABC twice a year (you can phone them to verify they do that). You can read the Reviews of our students on the web site. You can ask us for the contact details of former students who will talk to you about their experiences. We publish an Ethical statement here. Our bank is NatWest, 7 High Street, Wells, Somerset (we have money in the bank and no loans or overdraft). We're registered with the UK government's Register of Learning Providers (www.ukrlp.co.uk); Number 10009490. Our Licence number granted by the Office of Fair Trading under the Consumer Credit Act 1974 is 606843. And finally, we love what we do; and we wouldn't do anything to jeopardise it.